Even those who have forsaken technology need a place to grab a drink and enjoy the simpler pleasures of life. 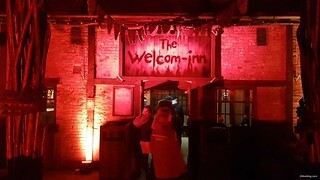 For the Beornen, the Welcom-Inn fits the bill as the prefect place to kick back and watch the chosen be initiated into the rites of the Wicker Man. The inn has a wide variety of alcoholic and non-alcoholic drinks available as well as a variety of spots to enjoy them. For colder days the inn itself offers a cosy spot or during the summer, why not slip outside into the neighbouring courtyard or the beer garden that looks out on Wicker Man. The inn has a special spot in the history of both the park and also in the lore of TowersStreet, as one of our favoured spots in the park (nothing to do with the beverages served... honest!). 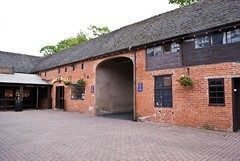 The Courtyard Tavern, as the inn was originally called, first opened in 1998 as a replacement for the restaurant Maid Marion's Fish & Chips. The tavern was designed to blend seamlessly into Merrie England, with its Tudor appeal and murals painted by the same artists who worked on the Secret Garden Restaurant. In 2002 the neighbouring Courtyard became home to a BBQ, with a pirate show also added when the area became Mutiny Bay in 2008. Both of these attractions were shuttered for the 2016 season and were due to be demolished in 2017 to make way for a new smokehouse restaurant, which would also have seen the removal of the Courtyard Tavern. The plans for the new restaurant were later shelved and so the BBQ remains for now, but is unlikely to ever reopen in its original form. 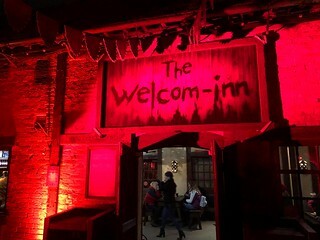 The tavern was also saved from the chopping block, however the arrival of the Beornen saw the bar become The Welcom-Inn.